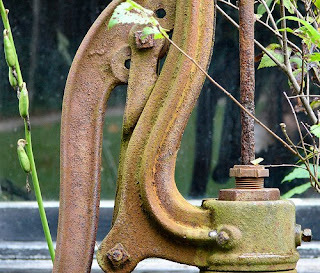 Have you ever had to prime an old fashioned water pump? You know the kind that has a manual handle? In order to get water out of the well, you have to pour some water into the spout and start pumping like crazy. Life can be a lot like that old manual water well. For example, if you want to be loved, you must give love. If you want well-behaved, disciplined children, then you must be disciplined yourself and willing to discipline your kids. If you need or desire more money to flow into your life, you need to "prime the pump" and give money away. This is one of those oxymoron-ish laws of the universe that God has established. From a human standpoint, it makes no sense. How does giving away more of yourself, your life, and your stuff bring more to you? Our human nature tells us to "get all you can, and can all you get!" With this approach, though, you will end up losing everything. Selfishness doesn't work. Give more of yourself and you will get more, and then plan on giving away even more! Give, and it will be given to you. A good measure, pressed down, shaken together, and running over, will be poured into your lap. For with the measure you use, it will be measured to you (Luke 6:38, NIV). So, Christian, let me ask you this. In what area(s) do you need to give more away in order to "prime your pump?"